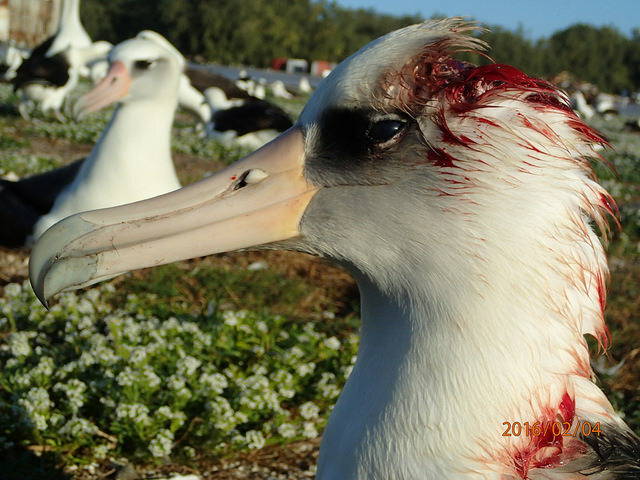 The mysterious vampire mice of Midway Atoll have left hundreds of adult Laysan albatross dead, their necks torn open in garish bloody wounds. These mice are doing something no mice anywhere else in the world are known to do. Late at night, they climb the necks of nesting seabirds and chew through the skin, apparently feeding on the birds’ blood, skin, fat and muscle. The albatross’ commitment to protecting their eggs is so strong that they will shake their heads, but will not leave the nests even with a predatory rodent chewing on them. And the problem has grown since it was first spotted in 2015. “It is horribly destructive what they do to those birds,” said Matt Brown, the U.S. Fish and Wildlife Service superintendent for the Papahānaumokuākea Marine National Monument, which includes Midway. The Fish and Wildlife Service has teamed up with a number of agencies and now hopes to eradicate the mice, which are an alien species to Midway. 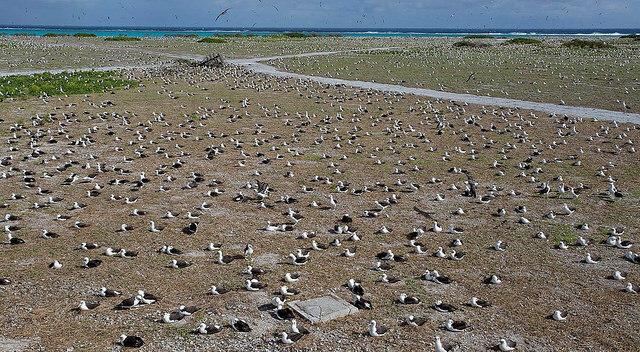 Among the 10 major atolls, reefs and islets of the Northwestern Hawaiian Islands, mice only occur on Sand Island, one of the three specks of dry land within Midway Atoll. The mice have been here at least since World War II, but the new vampirish behavior is both new to Midway and apparently new to science. Mice are known to take eggs and nestlings of seabirds elsewhere, but only on Midway do they attack large adult birds. 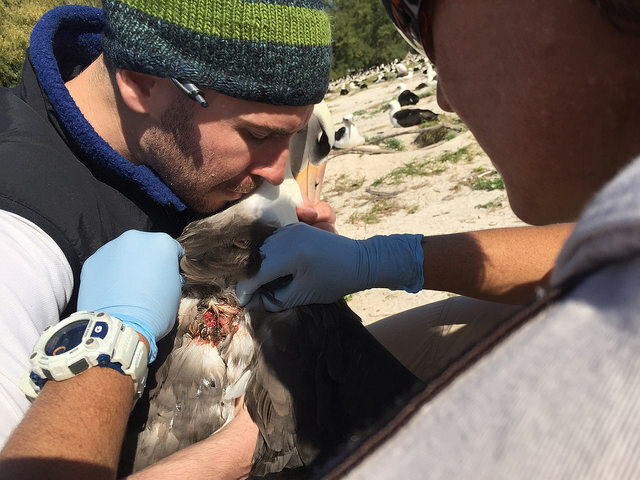 “This isn’t a behavior that has been observed before, although rodents have been responsible for a number of seabird extinctions and extirpations on islands,” said Megan Nagel, public affairs officer for the Fish and Wildlife Service in Honolulu. The proposal they’ve come up with is to try to eradicate the mice. New Zealand just completed a successful five-year effort to remove mice from the Antipodes Islands, where they were feeding on chicks and eggs of seabirds, apparently including the Wandering Albatross, whose 10 to 11-foot wingspan makes it one of the biggest of birds. The Midway approach will be similar to the one used at the Antipodes: a helicopter drop of toxic bait pellets during a period when the nesting seabird population is at its lowest. That’s also similar to the technique that has been used to remove mice from more than 80 other islands and to remove rats from more than 400 islands around the world. In Hawai`i it’s much like the system that was used to eradicate Pacific rats from Mokapu Island off Molokai and black rats from Mokoli`i off O`ahu, and which has been used to control rats at Lehua Island off Ni`ihau, a process that is still underway. 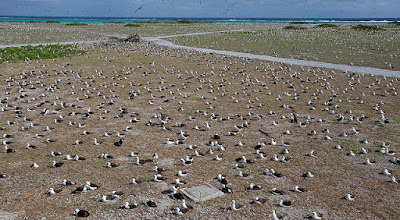 Rats were eradicated from Midway’s three islets in 1996. The environmental assessment for the Midway mouse effort, under the name Midway Seabird Protection Project, describes the issues and the proposed solution. The public comment for the environmental assessment is open through April 20. The helicopter would achieve a uniform islandwide distribution of specially designed bait pellets that contain the anticoagulant Brodifacoum. Some hand distribution will be employed in sensitive areas such as near the shore. The work would be done in the summer of 2019, during a period when seabirds are comparatively scarce on the island, and when dry weather limits mouse food supplies—making the grain-based bait pellets more appealing. There are a number of reasons to use a helicopter, including assuring an even bait distribution but also foot traffic in many areas would collapse many of the thousands of nesting burrows of Bonin Petrels, which recovered strongly after rats were removed. Similar eradication efforts on other islands have usually but not always been successful. In recent years, the success rate has gone up with improvements in technique. The environmental assessment reviews alternative approaches, and looks at the option of doing nothing at all. The Brodifacoum bait delivered by helicopter at the right time of year, in specific amounts over time, as described in the proposal, is viewed as the best alternative. The project is estimated to cost $3.5 million. It is not yet clear the source of that money. Many previous eradications have been funded through a combination of government funds, grants from foundations, and money from private institutions like conservation groups. The Fish and Wildlife Service would be the lead operational agency, with technical support and assistance from Island Conservation and the Midway Restoration Partnership Group. This is a collaboration of the Fish and Wildlife Serfvice and Island Conservation as well as American Bird Conservancy, the National Wildlife Research Center of the U.S. Department of Agriculture’s Animal and Plant Health Inspection Service, National Oceanographic and Atmospheric Agency, U.S Geological Survey and the state Office of Hawaiian Affairs. What's at risk :Midway albatross colony. Credit: USFWS. Mice attacking albatrosses is not new to science - mice have caused the same problems on other islands including Gough and Marion. Issues on Marion in the Indian Ocean's Prince Edward Islands and Gough in the South Atlantic's Tristan de Cunha Islands were mouse attacks on chicks. Before this, there have not been documented cases of multiple attacks on adult albatross.